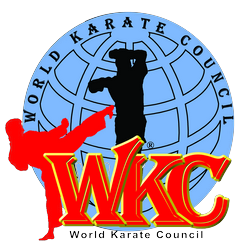 The W.K.C. Worldwide selects a champion annually in each category; the process for this selection is called competition. Only by hard work and effort can you the competitor Achieve the ultimate goal of getting on your Nations National Team to eventually attempt in becoming a world champion. You are the best your country has to offer so serve that trust with total dedication to the task at hand. And if failure does loom accept it with humility and strive to do better next year. The wise student learns that failure is just a learning curve on to the next level. In your martial arts study and training do not be afraid of making mistakes. When you don know, ask questions, for with the right knowledge you will know how to perfect the right technique. We are all individuals so do not attempt to become a copy of another. Create your moment, seize the opportunity, and aim for the top. Do not follow the path; go where there is no path and begin the trail. Train diligently and if after you find you are on a road to nowhere, find another road. Embrace change because that can open doors within your mind to other places of thought. From those thoughts can be born new ideas. In competition, don't forget, Strategy is better than strength. And remember rather fail with honour than succeed by fraud.